The Astro bed frame is a European styled bed frame with a rounded corner headboard and footboard with buttoned detail and angled light oak colour feet. 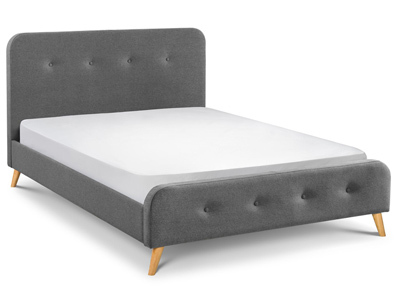 The bed frame is only available in Double or King Size and is covered in a mid-grey linen style fabric and is supplied with a sprung slatted base. Like all Julian Bowen products this bed frame is delivered Free of charge to most areas in 7-10 working days. England, Wales and lower Scotland are free of charge, please note Central Scotland and Scottish Highlands and other postcodes like LL and SA will incur a delivery charge and an extended delivery period, for more information please see delivery page.